Shopping for Harry Potter Action Figures? 12-inch tall action figure from Harry Potter and the Order of the Phoenix! Authentic likeness of Michael Gambon as Albus Dumbledore. 30 points of articulation, 5 pairs of interchangeable hands, and a detailed cloth costume! Accessories include his glasses, the Sword of Gryffindor, and the Elder Wand. Includes a great hall podium complete with 8 LED light-up candles! He looks so real! The collectible Harry Potter Order of the Phoenix Albus Dumbledore 1:6 Scale Action Figure from Star Ace Toys measures approximately 12-inches tall, with 30 points of articulation and a fully realized, authentic likeness of Michael Gambon as Albus Dumbledore in the movie Harry Potter and the Order of the Phoenix. With an accurate facial expression and detailed skin texture, the head sculpt is specially hand painted and includes rooted hair and a sculpted beard. 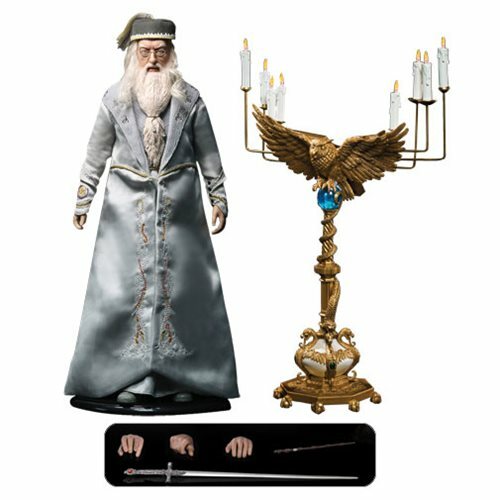 Made of plastic, Albus comes with 5 pairs of interchangeable hands, a beautifully detailed cloth costume, and accessories like his glasses, the Sword of Gryffindor, and the Elder Wand. In addition, there's a figure stand with a waist clip, and a great hall podium complete with 8 LED light-up candles to really set the mood! Ages 15 and up.